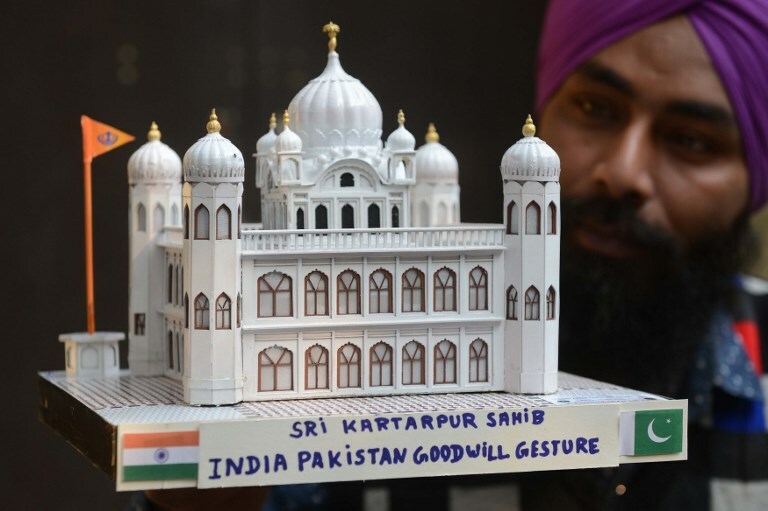 Islamabad/New Delhi – Nestled in the verdant green rice fields of Pakistan’s eastern Narowal district, the white domes of the Sri Kartarpur Sahib Gurdwara make a striking contrast. Centuries ago, it is said, Guru Nanak, the founder of Sikhism, spent his final days in this small village, farming the fields and formalising many of the practices of what would become a religion followed by more than 25 million around the world. When he died, in 1539, the legend goes that he was so revered by both Hindus and Muslims that there was a dispute over how his remains should be treated: should he be buried, in the Islamic tradition, or cremated, as Hindus wished. Today, at the Sikh gurdwara, or place of worship, built over his final resting place, there is both a Muslim grave, and a Hindu samadh, marking his passing. A few kilometres away, Sikhs gather at a podium to view one of the most sacred sites in their religion, lining up to pay tribute to Guru Nanak by viewing the gurdwara through a set of binoculars. They are unable to access the site, just five kilometres away, because between the two gurdwaras lies an obstacle that has been almost insurmountable for most: the international border between India and Pakistan. 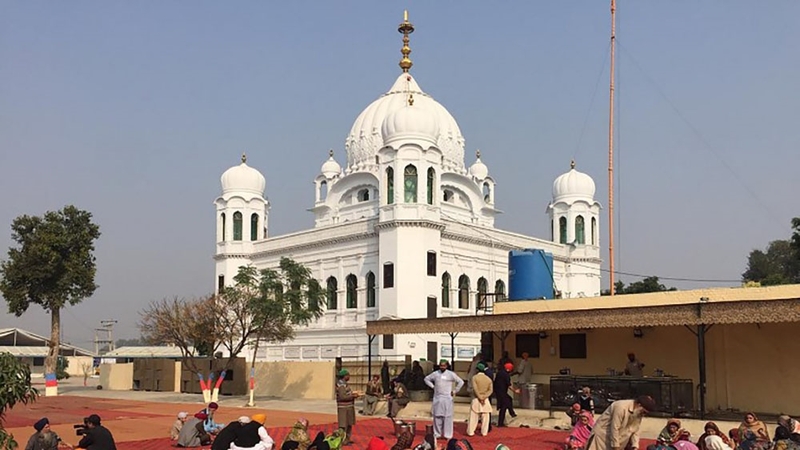 On Wednesday, Pakistani Prime Minister Imran Khan inaugurated a new visa-free corridor between the gurdwara at Kartarpur and the Indian town of Dera Baba Nanak, about six kilometres away. Sikh pilgrims will be able to travel freely between the two holy sites without visas for the first time since the border was established here in 1947, when India and Pakistan gained independence from Britain. Khan, inaugurating the project, which will see the construction of a new road and bridge that would link the two sites, spoke of wanting to open a new era of relations between India and Pakistan. Also present on the occasion were Indian federal ministers Harsimrat Kaur Badal and Hardeep Singh Puri, and provincial Punjab minister Navjot Singh Sidhu. The inauguration in Pakistan follows a similar event on the Indian side of the border earlier this week, attended by the chief minister of India’s Punjab province and the country’s vice-president. The corridor will formally open next year, in time for the 550th birth anniversary celebrations for Guru Nanak. It marks a rare moment of positivity in relations between the two South Asian nations, who have fought three wars since gaining independence and between whom dialogue has been stalled for years. Earlier this year, India cancelled planned foreign minister level talks on the sidelines of the United Nations General Assembly, following the killing of Indian security forces personnel in the disputed region of Kashmir by armed separatists. India accuses Pakistan of supporting the armed separatist movement in Kashmir, which both countries claim in full but administer separate portions of. Pakistan denies the charge, and alleges that India foments instability by supporting separatists in Balochistan province. With the opening of the corridor – a long-standing demand of the Sikh community and one which Pakistan proposed be followed through earlier this year – the Pakistani government says it is showing that it is prepared to take concrete steps to ease tensions. “The story of Kartarpur is as old as the history of Pakistan and India’s independence itself,” Fawad Chaudhry, Pakistan’s information minister, told Al Jazeera. With the inaugurations this week, work will now begin on a fenced off road between the gurdwara at Kartarpur and the gurdwaras on the Indian side of the border, which will allow Sikhs to access both sites without a visa. Previously, Arora says, pilgrims were forced to cross the border at the Wagah/Attari crossing, a journey of more than 200km that involved dealing with a restrictive visa regime and travelling by road for hours. Analysts say the Indian government, led by right-wing Prime Minister Narendra Modi, was pressured into opening the corridor due to domestic political pressures. It is a point that has been made in Pakistan, too. One of the sources of opposition to the corridor within India has been security concerns regarding the free movement of citizens between the two countries, even in the controlled environment of the corridor. “There are apprehensions that some left-over elements of the [Sikh separatist] Khalistan movement still operate from Pakistani territory,” said Sreeram Chaulia, Dean of New Delhi’s Jindal School of International Affairs. Sikh separatists in India began agitating for a separate homeland in the 1970s, but the movement petered out two decades later. India believes there has been an attempt to revive separatist groups in the recent past. Pakistani analysts, too, warn that while the corridor may be a rare success story, the prospect of any resumption of dialogue between the countries remains dim. “This is a good move in a situation where there is little hope of any improvement tin the relations between the two countries,” said Zahid Hussain, an Islamabad-based security analyst. “But I don’t think it will change the overall atmosphere that prevails right now. It’s more for public consumption rather than a move that could change the politics of the region,” he added. Hussain points out that the opening of the corridor could not have occurred without backing from Pakistan’s powerful military, which has ruled the country for roughly half of its 71-year history. Army chief General Qamar Bajwa has publicly supported the project, and first discussed it with Indian legislator Sidhu at Prime Minister Khan’s inauguration in August. General Bajwa was also in attendance at the ground breaking on Wednesday. Pakistan’s government is planning further confidence building measures, Information Minister Chaudhry said, including the easing of visa restrictions on Indian journalists. Chaudhry was referring to an attack on the Chinese diplomatic mission in the southern Pakistani city of Karachi by Baloch separatists on Friday, which killed two policemen. Regardless of the tension in the relationship between the states, the Sikh community remains jubilant about the opening of the corridor. Zeenat Saberin is Al Jazeera’s digital correspondent in India. She tweets at @SaberinZe.